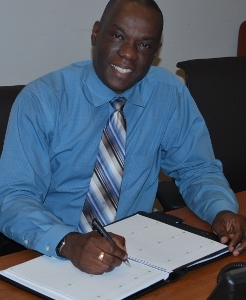 (CNS): The Cayman Islands’ government has appointed Duke Munroe as Chief Petroleum Inspector to oversee the safety and regulation of the sector. According to government officials Munroe who is a native of Guyana comes to the civil service directly from the private sector and his former job as the Regional (functional) Manager for Chevron in the Caribbean. Munroe said having worked with the Cayman petroleum inspectorate in that job he was very impressed with the functioning of the department and its mandate as required by law which is what encouraged him to apply for the post. "It was the most structured, well-defined and organized regulatory body to which the major petroleum companies were subjected, in all of the territories I managed under Chevron,” Munroe said. Alan Jones, Chief Officer for the Ministry of District Administration, Works, Lands and Agriculture said he has a strong academic and engineering background and looked forward to his contribution to the office. During his tenure with Chevron, Munroe worked in finance, accounting, legal, logistics and supply chain management, procurement and administration. Over almost 10 years in the petroleum industry, one of his key roles was safety, health and environmental stewardship. “While these areas are critical to everyone in the petroleum industry, my role was more active in driving compliance in these areas. This involved complying with standards across the industry and its governing bodies. Further, my responsibility at Chevron covered 15 countries in the Caribbean and South America, including the CaymanIslands. Essentially, in my latter years I managed the company’s assets (retail, industrial properties and facilities) in these territories,” he added. The Petroleum Inspectorate (PI) was established in 2003 to ensure that sound industry codes of practice were adopted. It was also charged with ensuring that safety and environmental management systems are effectively developed and implemented and ensuring that proper emergency planning and coordination are carried out. Additionally, the role of Petroleum Inspectorate is to assess whether the petroleum and compressed gas industries are adequately managing their obligations to safeguard health, safety and the environment by regularly conducting inspections of the facilitiessuch as the bulk storage terminals, service stations, marinas, utility companies, Liquefied Propane Gas (LPG) facilities, compressed air facilities, industrial and wholesale tanks and vehicles transporting petroleum. a gas break, meaning the price of gas should be less, since they make less $ over their and the majority of workers depend on PWD for work and their pay checks are smaller there than compare to G-Cayman, but the gas prices are 40 cents more than g-cayman. And so we slowly start to grasp the concept of economies of scale. . . I hope he also be doing his job, the price of gas keep dropping in USA but it nothing here, it feels like summer with the price gas still so high! OIl hit a 43 month high last night.